Dad always told me: Never buy a new car. In time, I’ve learned this isn’t another one of those “dad-isms.” It’s true; there are perks to buying used — mostly the price tag. However, you must err on the side of caution to avoid investing in a dud. I spoke with our own assistant editor and former automotive mechanic/technical writer Justin Cupler to learn the ins and outs of buying new cars. For the longest time, my family never invested in new cars. And my dad’s reasoning mostly had to do with the price tag. What’s that mean, exactly? You’re not burning your money as soon as the tires leave the lot. Plus, you can resell the car for a value that’s closer to what you initially paid. Cupler encourages you to think about it this way: A used car starts paying for itself a lot faster than a new one will. “But don’t do it,” Cupler says. Once you do the math, you’ll probably end up paying more due to insane interest rates. And, whatever you do, Cupler vehemently says to avoid used car lots. He suspects used car lots won’t be around much longer, especially with online sites such as Beepi, Carvana and Vroom popping up. These sites specialize in buying and selling cars, ones that tend to be better than those you’ll find on the lot. Another perk of online used car shopping? You aren’t charged extra fees for the dealer’s commission or any overhead expenses. Oh, and the car is delivered to your front door. The only downside is you won’t be able to test drive it. However, most of these sites have a return policy. For example, Beepi has a 10-day, no-questions-asked policy with a money-back-guarantee,. Many people also use Craigslist to find used cars, but Cupler describes it as “a tough one. If the deal is way too good to be true, it’s probably fake.” So be careful. You can also opt to go more old school. Check out Autotrader or your local newspaper and magazines. One of Cupler’s favorite ways to find the perfect used car is simply driving around. “Bring a passenger and tell them to look out for any gems,” he says. Heck, it might even be a fun weekend adventure. You can also check out certified pre-owned cars from dealerships. Translated: These are solid, like-new cars with a “used” price tag — and fewer miles. But that’s the only time you should go to a dealership, Cupler says. If you’re going to purchase from a dealer, the answer is simple: Do it at the end of the month or end of the year when sales goals and bonuses are involved. However, when you’re buying from a private dealer, there’s no real science to follow. Cupler’s best suggestion is to think logically. If winter is rapidly approaching, avoid going out and buying a snow-equipped, all-wheel drive vehicle. Prices might be higher then because demand will be higher. Think about it in the summer instead. And same with a convertible, for example. It might be better to buy that in the winter. Other than that, timing isn’t everything here. You’re going to have better luck looking at the specs. 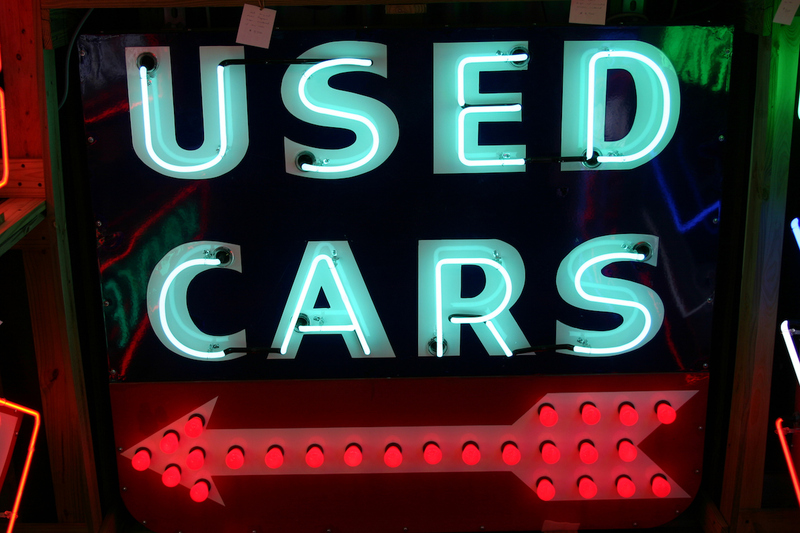 Now you know where and when to find used cars, but how do you find that perfect gem? If you’re like me, someone with zero car knowledge, the thought of this process produces a small knot in the depths of your stomach. But don’t worry; here’s a numbered list to get you on the right track. 1. Determine the value of the car. Once you’ve set your budget and found your desired make and model, find out what the car is actually worth. Cupler recommends looking into the car’s Kelley Blue Book value first. This is simple: Select “Price New/Used Cars,” click “used” or “certified pre-owned” then type in the make and model. You’ll select the car’s specs and get a suggested retail price. If you aren’t sure what exactly you’re looking for, you also have the option to browse car types. Cupler encourages keeping in mind you can finance used cars, too. 2. Consider the obvious: the mileage, the year, the maintenance costs. Newer cars can survive longer than older cars. “Modern cars can go 200,000 to 300,000 miles,” Cupler says. Compare that to older cars, which might perhaps max out around 150,000 miles. The older it is and the more miles it has, expect to sink more money into maintenance. Also, consider the make of the car. 3. Check out the history of the car. “This is the big one,” Cupler says. The go-to site for this is Carfax. There, you can pull the vehicle’s history report. It’ll cost you $39.99 for one report. But if you’re planning on shopping around, I recommend getting the $59.99 package for five reports. Sure, it’s not the cheapest, but it’ll be worth it in the long run. The odometer: Be sure the seller isn’t fudging it. The number of owners: “Multiple owners can mean the car wasn’t properly maintained,” Cupler says. Because it’s bouncing around, it might not have received the proper maintenance. Any accidents: Do note these only show up if an insurance claim was filed. Typically, it will be (consider: cost of repairs without maintenance), so this is 95% accurate, Cupler says. Where has the car been? : This comes from your own deductions, but if a car was located in, say, North Dakota, you might assume it’s been through some snow and salt, which isn’t good for the car. You can find a wealth of information from these reports, but you’ll want to dig into the current owner’s files to get the full story. 4. Dig into the maintenance history. You’ll need two items to dig into the maintenance history: the records for the current owner and the owner’s manual. The owner’s manual will likely chart out required services by two ratings: normal and severe. Cupler says always look under the severe column. So say the car sits at 60,000 miles. (Remember, check this reading against the Carfax reading.) In the owner’s manual, see what maintenance was required up until this point, and make sure it’s been done by checking it against the owner’s paperwork. 5. Take the car to your local mechanic. If the car is in good condition and the owner has nothing to hide, this shouldn’t be an issue. The owner might want to accompany you, but they shouldn’t be shocked if you ask for this. A mechanic can find problems you probably won’t be able to see. 6. Consider the car’s cosmetics and accessories. “Tear everything apart,” Cupler says. I picture my dad’s classic move — knocking on each part of the car like it’s going to determine its durability. But don’t hesitate to look under the seats, open the hood (if it’s dirty under there, chances are it isn’t regularly washed) and consider any squeaks or rattles. Carpet funky? Yikes. Also get to know what should come with the car. For example, if the spare tire and kit are missing, consider you’ll have to buy that — not a cheap investment. Ask the owner if they’ll throw it in or if they’ll knock that expense off the price. And always use your “people skills” when it comes to the owner. If they’re trying to steer the conversation or rush the sale, stand your ground. Your Turn: What do you always consider when buying a new car?